We’re baaack…at least at the blog – and just in time for this very cool challenge! – Ce Soir Arts – Be inspired tonight! We’re baaack…at least at the blog – and just in time for this very cool challenge! Well! (Harumph!) A little NOSEY, don’t you think? Very private information, that. So private that even we did not know the answer. We’ve long suspected it, though. Our Inventories are filled with the trappings of this lifestyle…luxurious (some, slightly blood-stained – ahem!) 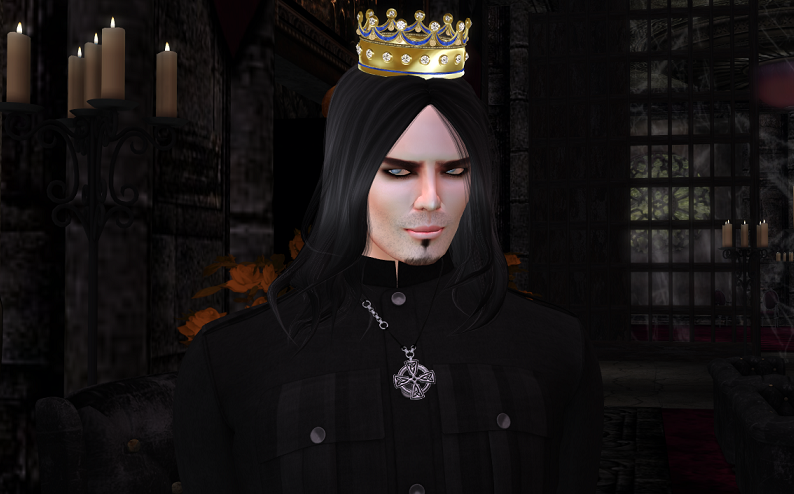 clothing and dark, rich furnishings offer a hint or two as they languish next to our medieval outfits and our modern gear. But it’s time for us to face the truth after all these years. It’s something we’ve sort-of known for awhile, having caught the rare glimpse of one bedraggled Mireille just coming in as the pale light of morning shows itself…or logging in to catch Aeon hanging out at the Ce Soir Mausoleum. For shame! Sneaking around like that! Aeon & Mireille Holding Court at No Salvation! Yes, it’s true! Those shadowy rumors are true! 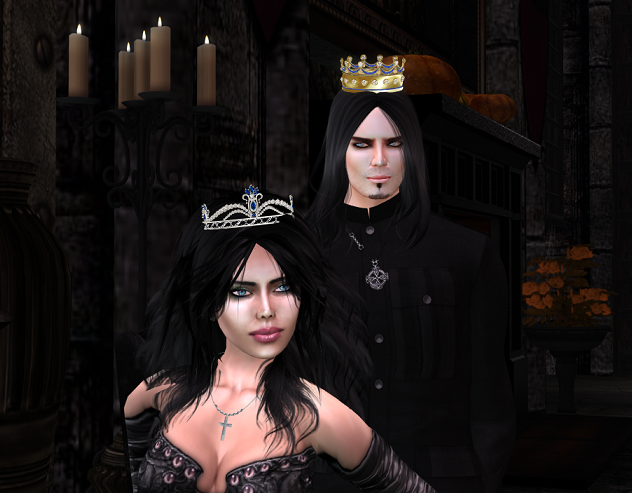 Aeon and Mireille are King and Queen of the Vampyres! (Apparently.) I mean, just look at them! Holding court at No Salvation like they own the place! (Cheeky!) (And…a handsome pair!) Oh, and look closely at the close-ups below…those luscious lips are hiding some fine fangs… And yes! These two do bite! hahaha who knew your avatars had such a dark side? 😛 Thanks for playing! This post is *beautiful. * Tell me I don’t have to fight you too now though? You are truly an inspiration to many. We thank you!